After 6 years and 600 schools attending OESIS, we took our network fully online this last year in a Canvas hosted platform called OESIS-XP. Available on a school only basis, we provide the largest repository of recorded and live innovation content for independent schools. Convenient, and at a fraction of the travel costs involved in attending conferences, OESIS-XP provides fast and deep exposure for your faculty and real ease of set up and use. Alongside the webinars (now over 150 and expected to be over 250 by 2019), we have listservs by division and department, and modules called XP pathways we are developing for teachers to find a route to student-centered learning environments. 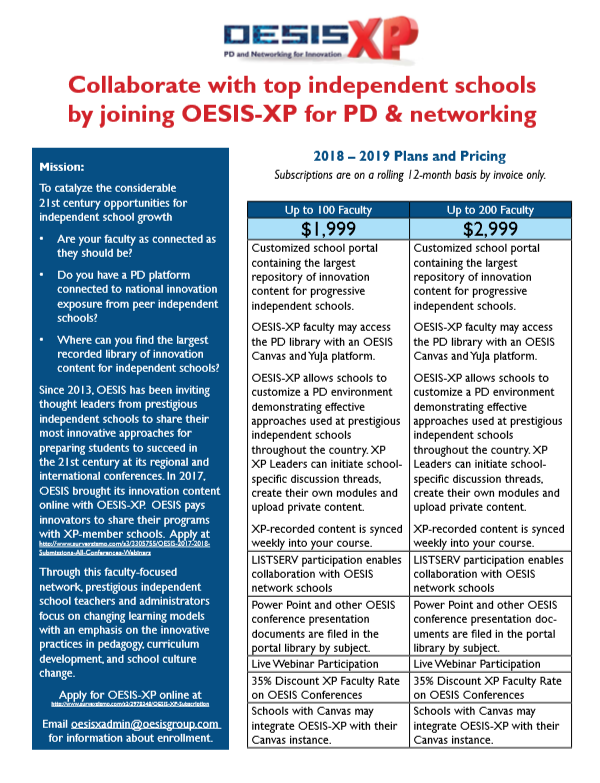 OESIS-XP membership comes with discounts at live conferences and other OESIS services.